This is such a delicious dinner! And so easy! John marinates the fish for about a half an hour and in the meantime I whiz up two cans of chickpeas with some water, oil, lemon and herbs in the food processor. The parsley sauce I make with my stick blender and it’s just parsley, lemon juice, a little oil and salt and pepper. The fish bakes for about 15 minutes (depending on the thickness) and while that is baking the chickpea puree is heating very slowly in a pot on the stove. Since there’s not much texture I added a crunchy salad with a spicy chile and an acidic salad dressing. 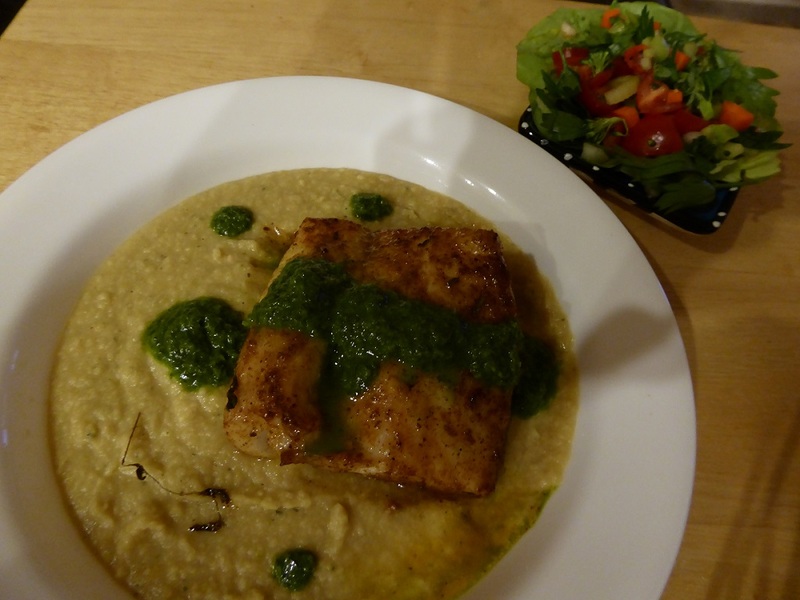 Pacific cod on chickpea puree with a parsley sauce. Side of crunchy salad.